ANGELO BRATTISANI born 1843 in Parma, Italy. He was the brother of our direct line Giuseppe Brattesani. He was known as Sante. He married Maria Delgrosso in Italy and members of their family emigrated to Scotland and were very much a part of the Brattesani dynasty of fish restauranteurs and confectioners in Scotland at this time. To date we have traced the following children SANTINO born 1875, ANTONIO, 1878, GIUSEPPE 1879, LORENZO 1881, CELESTE 1884, DOMINICK 1885, ANGELO 1887. Santino, Giuseppe and Celeste came to Scotland and assimilated very well into this new country. Lorenzo emigrated to the New World, Orange county I believe. Their eldest son Sante Brattesani travelled to Scotland but it is not until the year 1901 that we catch up with Sante residing with his cousin Valentina Brattesani Quilietti at the family address at 9 Greenside Place. Of course the whole family was resident here, Valentina with her young family, her dad and numerous cousins, uncles and siblings. He would become stepfather to the Quilietti children when he married his first cousin Valentina Brattisani Quilietti in 1901. Their marriage was shortlived as Valentina had four miscarriages in the next four years. Her last pregnancy caused her her life. Sante buried Valentina in a family plot in Easter Road Cemetery beside her mother who had died in 1900. The grave of her first husband Emilio Quilietti lay opposite her. He erected a headstone in honour of her life telling the world that he had done so! Sante took over the businesses which had been Emilio’s and in 1915 he had five shops in the Greenside area as well as now being head of household at No. 9 Greenside Place. 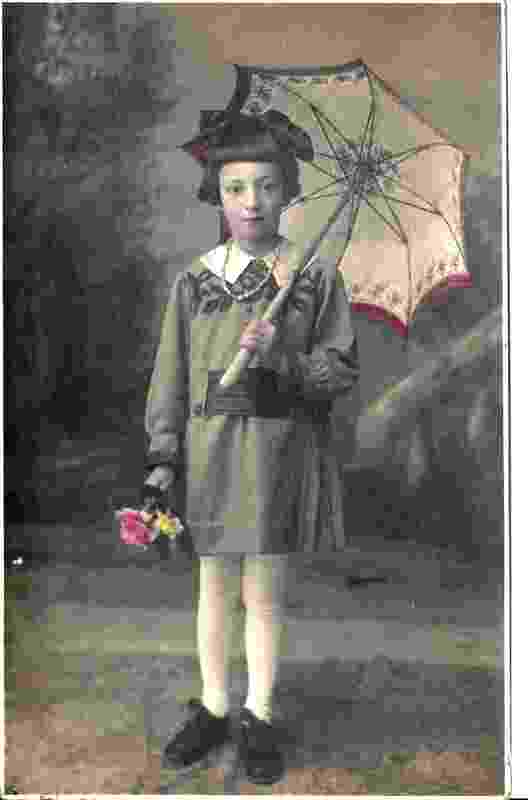 Shortly after the death of Valentina Sante returned to Italy and in November 1906 married Louigie or Gina Peruzzi in San Vincenzo, Parma, Italy. He then brought her to Scotland and married her again on 4th January 1907. They had four children, but only one survived, Eva Maria Brattesani. After 1925 we find no further trace of Sante or his wife in Scotland. It is believed that he returned to Italy. 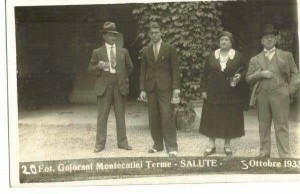 We know that the Quilietti family had affection for Sante as his eldest stepson Giulio Quilietti named one of his children after him, Sante Brattesani Quilietti. Maria was born in 1906. Maria died tragically in 1924 and is interred in Mount Vernon Cemetry in the Capital. A great monument is erected to her in the shape of an angel. Their son Giuseppe, known as Joseph , was born in the year 1908 at No. 5 St. Stephen Street in Stockbridge. When he was 19 he married Evelyn Reid also in St. Mary’s Cathedral. They went on to have five children. JOSEPH BRATTESANI their eldest was born in 1937 . Joseph married twice. First wife was Eleanor Thomson who he married in London Road Church in the year 1960. They had one daughter Elaine Brattesani who was born in the year 1964. Some years later he married again to Agnes Fairnington. They had two children, Joseph born in 1973 and Samantha in 1974. This branch of the family were involved in the restaurant and fish and chip shops until just recently and they also ran the Fairnington Hairdressing Salon at Dalkeith Road, Edinburgh. Today they have a guest house in the south of the City. Samantha pictured here lives in the borders. CHARLES BRATTISANI was born in the year 1939. In 1968 married……….Scott. They have one daughter Charlotte was was born 1979. Charles ran the Haymarket fish restaurant from 1966 when a fish supper cost two shillings until ‘The Last Supper’ was served only a couple of years ago. GEORGE BRATTISANI was born in the year 1941. In 1960 he married Agnes Thomson in London Road Church in Edinburgh. They have three children George born 1961, Paul 1963, and Jacqueline in 1966. George remarried in the year 1971 to Lorraine Edmonds. George Brattisani died in 1988. MARIA BRATTISANI was born in 1952. Maria had a daughter Donna Brattisani who was born in 1970. Angelo’s third son Celseste was born in Rovingalia in Parma on 5th March in the year 1884. Celeste moved to Scotland in the year 1907 and helped out in the now famous Brattesani Tolcross fish and chip shop working with his cousins in the family business. He married Mary Graham Ewan on 18th January 1911. Their children soon came along, Alice was born in Cowdenbeath on 2nd May 1911. Next came Maria Delgrosso who was born on 24th September 1912 at the same address 142 High Street, Cowdenbeath. Then came the boys. A delight for the Brattisani families whose sons in Scotland had been in short supply for some years. Angelo Brattisani was born on 10th July 1915. Then came Celeste born in 1916. Angelo went on to marry Isobel Ritchie Moir in Grangemouth on 14th August 1939. They have two sons John Brattesani and Celeste Alexander Brattesani. Maria Delgrosso and Alice we believe emigrated to the U.S.A.
Celeste Brattisani [senior] frequently visited relations in America and travelled in 1938, 1952, 1954 . On the 18 Feb 1947 he even cruised on the famous Queen Elizabeth from Southampton to New York. They travelled in 1954 to 138 Glendale Avenue, Highland Park in Long Island, New York. In 1938 it was to the address of his Quilietti relations in the U.S.A. Alice Aitken was named on the ship manifest as the person he was visiting there. Alice was the daughter-in-law of Angelina Quilietti. This visit was two years after she and Gaetano Arpino had married in 1936. This is proof that the Quilietti, Arpino and Brattisani families kept in close contact many years after the deaths of Emilio and Valentina Quilietti. Bonjour. Je suis française. Mon mari est d’origine flamande. Il a connu un OXENAAR patrick dans sa jeunesse (décédé à l’âge de 23 ans) dont la mère s’appelait Pierina Antonietta BRATTESANI (décédée en 1972). Les parents de cette dernière s’appelaient Angelo BRATTESANI et Mary Paulina DICKSON qui s’étaient mariés début 1917 à Saint-Martin, Londres. Pourriez-vous me dire si ces BRATTESANI sont connus de vous ? Une information supplémentaire vient de me parvenir. Il s’agit de l’acte de décès de Pierina BRATTESANI le 18/10/1972 à Clichy-la-Garenne (Hauts-de-Seine, FRANCE), dans lequel est fait mention de sa naissance le 30/12/1918 à Albareto (ITALIE). J’espère que ce détail pourra faciliter les recherches de liens entre votre famille et Pierina. bonjour encore Christiane. Merci beaucoup pour cette information supplémentaire. Je vais commencer bientôt sur la page. J’ai mon arrière-grand mère qui était une Brattesani et avait de nombreux frère et sœur. Pierina était certainement une sœur. Merci pour votre commentaire. Est ce que vous connaissez le prenom de votre arriere grand mere? Nous sommes probablement relie , la famille Brattesani vient d une meme branche.